The dying art of writing? I would consider myself a good writer. I would even consider myself a fairly good writer in my second language. However, when I was 9 years old I remember vividly that I had a thorough hatred for writing and that I had a recurring daydream when it came to writing things in class. My daydream revolved around inventing some sort of machine that could magically take all the ideas I had in my head and write them for me without me having to actually exert myself with the enormous effort that writing often takes. Fast forward till 2015. Now we have all manner of technology which can do all manner of things and one of those things is my 9-year-old self's dream: speech to text technology. But, it has left me wondering: would I be as good at writing today if I had chosen never to write things down but to use some sort of speech recognition software instead? Or is the skill of formulating oneself to be understood not actually dependent on the physical act of writing/typing? Currently, these softwares are not so amazingly accurate yet we have introduced it to our classes as a support tool which all children can choose to use if they wish to. However, I have some concerns. The fact that they are so inaccurate means that children need to go back and edit the writing afterwards and I'm left wondering if this is actually even more of a demanding skill for children who most need support with writing in the first place. Are we doing children a disservice by allowing them to not 'write' in the conventional sense of the word or is it the skills of how to express oneself more important regardless of the method used? Will the skill of physically writing/typing actually die out in our lifetime? I thought it was time to resurrect this blog from the ashes. In the time I've been away an awful lot has happened. In February 2013 I decided that I couldn't cope with all the politics and stress of teaching any longer and decided to walk away from a profession that I loved. Not only that, I decided to up sticks and move to a new country and start a new life with new challenges. I've spent the last year learning a completely new language, making new friends and generally learning how not to work quite so hard (although I studied hard instead ;-) ). I have spent many wonderful hours with my gorgeous nephew and sister and have really appreciated getting to be close by. The hunt for a job was difficult as there are not many around except for summer jobs in restaurants for which I'm seemingly unqualified. Everyone kept convincing me to apply for teaching jobs but I had a hard time convincing myself. I'm not actually qualified yet to teach here, I have to do my language exam first to show I am fluent enough; it's booked for the end of October. However, I was lucky enough to find a job as a fritidspedagog (think teaching assistant/after school club leader and you're about there) and it was after a discussion about blogs today that I thought it might be time to set the fires burning again. There is absolutely no doubt in my mind that education is completely different here which is both good and bad but one things for certain, the stress is nowhere near the UK and teachers work WITH instead of AGAINST each other. To be fair, I experienced a great deal of working with each other when I was at teacher related events, especially things like teach meets and camped. I just wish there had been more of that within the school building. The teachmeet concept is a relative unknown out here but I would love it to be bigger because I miss them, might have to plan one of my own! My school has a fair amount of challenges but it has the most wonderful setting: we have a fairly extensive forest just crying out to be made the most of as well as very good ict provision (1:1 for those age 10+) and a new set of blogs which I'm in the process of building. The county council also has a county wide deployment of google apps which is great as the children can then take their accounts with them when they move schools. I'm very excited to be where I am, even though it wasn't where I ever expected to be. As Douglas Adams once wrote: I seldom end up where I wanted to go, but almost always end up where I need to be. Before we start this is a Torus. It's a three dimensional shape with only one face (a bit like a sphere). Weird, huh?! 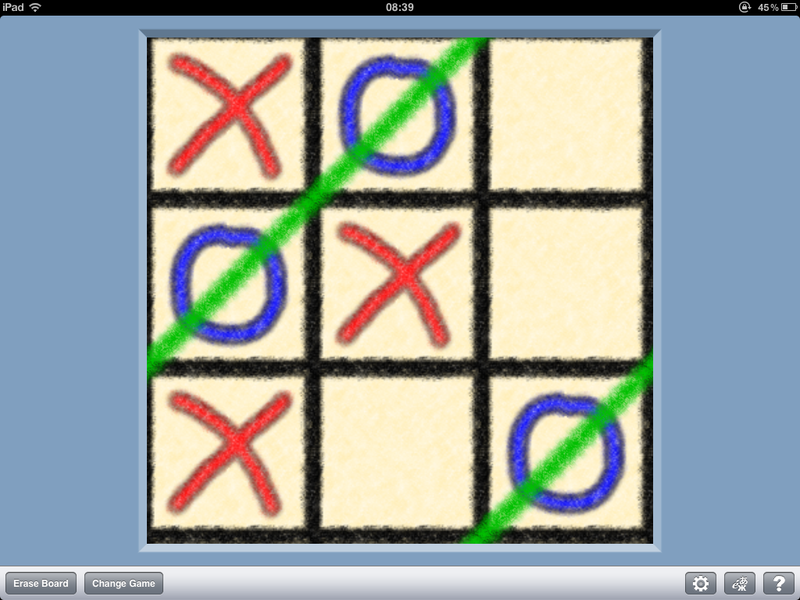 This is because the right side loops back round to meet the left side, even though the board looks flat. I think this would be great for children to develop their thinking about strategy and 3 dimensional space. It would be great for kids to develop it further and do some research into the Torus and perhaps have a go at drawing one in Google Sketchup or (slightly more advanced) modelling one using Geogebra. Mindset by Carol Dweck is not my usual read but I have heard a lot about it over the years so when it was available for 99p on the Kindle the other day I thought I'd give it a go. It's a popular psychology book where the author has spent a long time studying people's thoughts and beliefs (or mindsets) on intelligence/talent. It's actually a much easier read than I anticipated (I read the entire thing in a day) and very easy to understand. Fixed - a belief that intelligence/talent is something you are born with and no amount of learning will change things. These people have a sense of needing to prove their intelligence constantly and fear criticism and not being the best. These people will often not try something new for fear of being shown up or failing at it. Growth - a belief that intelligence/talent is developed through effort, hard work and challenge. These people are willing to challenge themselves and try new things. They want to make themselves better but understand that mistakes will help them improve. They often tend to be more motivated to carry on with something even if it is not going well. It also discussed that all people are a mixture of the two and that you can have a fixed mindset in one area eg belief about your maths ability, and growth mindset in other areas. The bit of the book that influenced me most was the discussion of several studies into offering praise to people for something they've done and the outcome this has on their future choices. In the studies they gave two groups of people the same test. After the test one group they praised how smart they were eg Well done, you got 80%, you must be clever! and the other half they praised their effort eg Well done, you got 80%, you must have worked really hard. After that they offered another harder test; those praised for effort in the previous one showed much more willingness to challenge themselves to have a go at the harder one. Many praised for intelligence chose not to take the harder test. They also showed that when asked to discuss their results with others those that were praised for intelligence were much more likely to lie about their results to make themselves sound even better. I find this really interesting as a teacher as clearly this has implications about the language used to praise children. Schools, particularly primary ones, are usually very focussed on praise, but perhaps we need to be careful about how we word the praise so that it encourages a growth mindset rather than a fixed one. The book goes on to discuss fixed and growth mindsets across sports, business and education. As a teacher you could just skip out the chapters on sports and business although I think there are interesting messages within them to think about. The final chapters plant the seeds about how you might change your own thinking to more of a growth mindset, basically by encouraging you to think about the way you approach things. It's definitely a book I would recommend to get teachers thinking about intelligence and talent, how learning happens and what prevents learning, and especially the barriers people (including young children) put up to protect themselves. In order to decode the messages, you needed to know how the coded machine had been set up - which rotors had been used in which order and their start points. During the war, the settings changed every 24 hours, again to make the codes even harder to crack. Although it all sounds quite complicated you can make a paper version of the Enigma machine very easily as someone has already done most of the work for you. 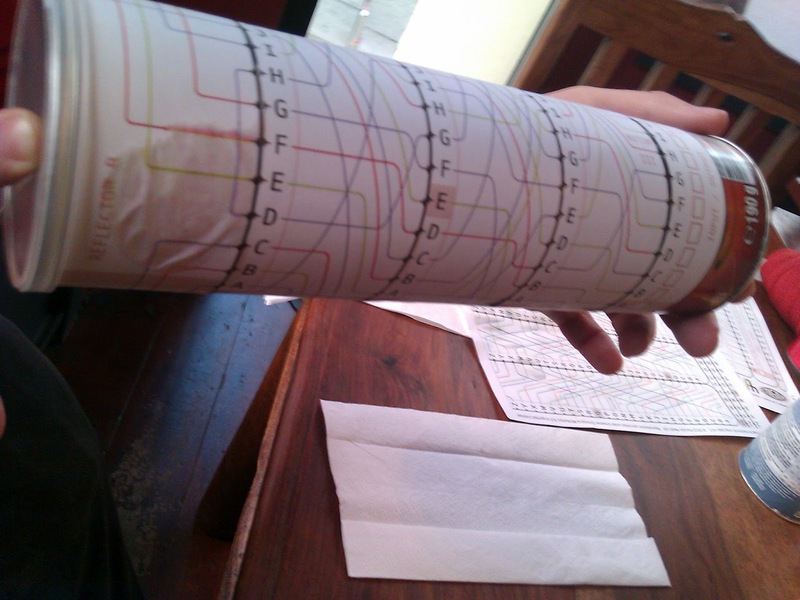 You can download a paper enigma machine (this link will download a PDF) that fits perfectly round a pringles tube. Here's one @TeaKayB made earlier. You can then encode messages to send to others and as long as they know the settings you used to write your message they can use the same ones to decode it. Simple! I think this would be a great addition to anyone studying WWII as a topic or as part of a maths challenge all about codes and ciphers. 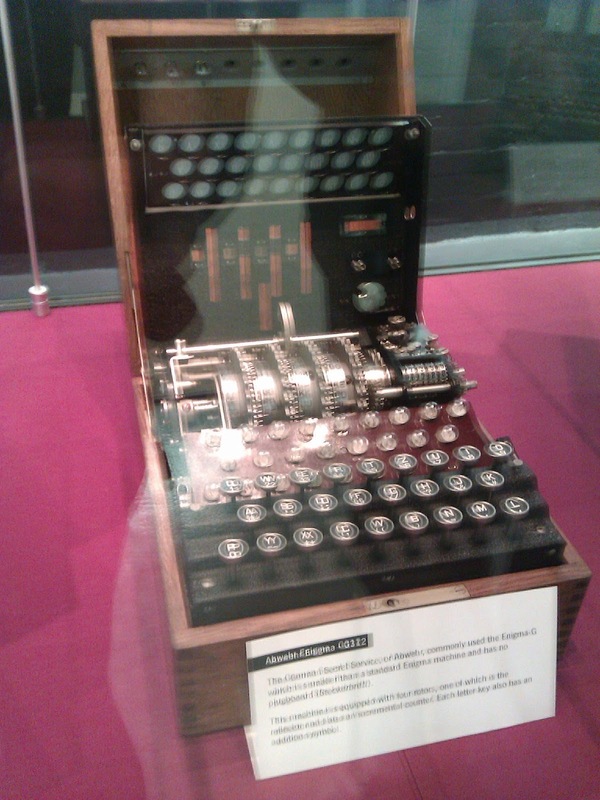 I wonder if the children could even develop their own code machine along similar lines. (If you want to see the real thing and learn about them in more detail then get yourself along to Bletchley Park in Milton Keynes. You pay £12 for an annual pass and can then visit as many times as you like - not a bad deal at all as there's way more than a day's entertainment there). A lesson on probability I think most primary teachers will have done in their time involves getting children to roll two dice, add up the scores and find which totals occur most often. Children can make predictions before hand, test them and then find out whether they match. This can then lead on to discussions about why they may or may not match any preconceived ideas which in turn can then lead on to talking about theoretical probability of each total and children can work them out. Most would leave it here. I certainly have in the past. That was until I went to a MathsJam and was set the challenge of coming up with other dice that had the same probabilities as a normal pair. It struck me that this would be a fantastic extension activity to the one above and would keep kids going for hours trying different things out, as it did us in the pub, trying to come up with different ways to make our dice. 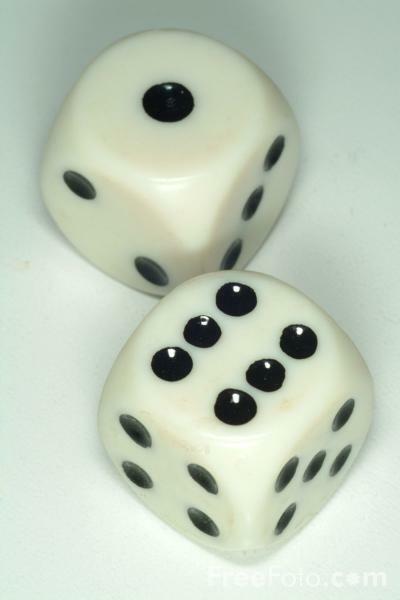 There is in fact one other way to make the dice, known as Sicherman dice, which give the same probability. They are numbered 1, 2, 2, 3, 3, 4 and 1, 3, 4, 5, 6, 8. You could also develop this to see if children can make dice where the probability of getting all totals is the same, or say, the chance of totalling 6 is 4/36. There's also the possibility of exploring other types of dice eg 10-sided or only odd numbers etc. It's definitely an idea I'll be saving for a future opportunity. Many schools nowadays are investing in iPads for education; my school doesn't have any but I have my own personal one so thought it might be sensible to blog about any apps I come across that might have some educational value. 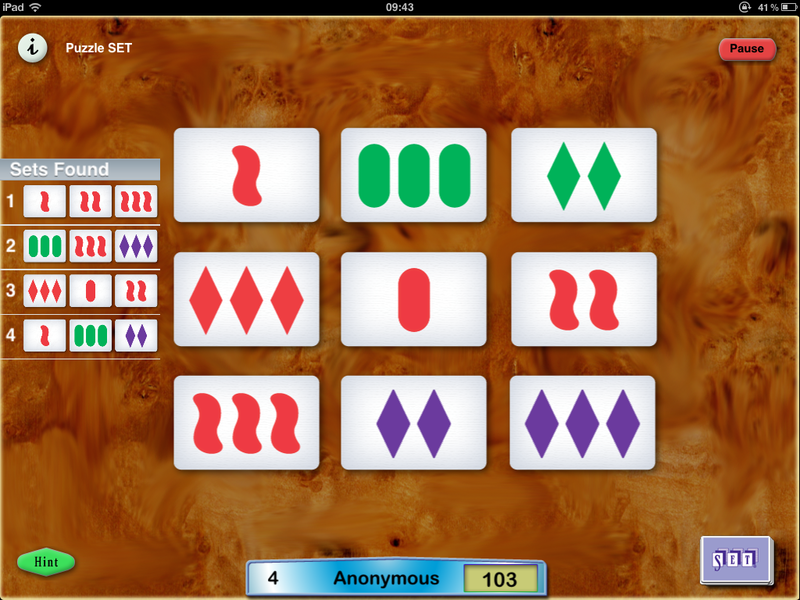 The app I'd like to share today is called SET Pro HD which costs £2.99. 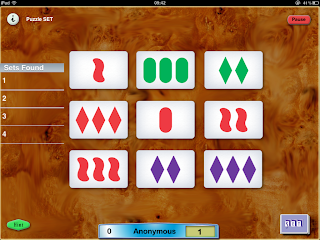 It's great for encouraging logical thinking and there are several different setups of the game - traditional 1 player puzzles, playing against the computer or playing against another person. The basic idea is that you are presented with an array of cards (you can also get this in card form) either 3x3 or 3x4 and you have to make sets of 3 cards. Sounds easy - it's not! The sets have to follow certain rules which make it more complicated. To make a set it either has to have the same number of shapes on each card or have 1,2,3. But you also have to make sure that everything else matches or everything is different. The parameters that count are shape, colour, filling (the ones above are all filled but harder games include striped and unfilled too) and number of shapes. 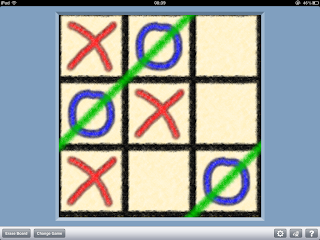 I think this would be a great game for upper key stage two children to play in maths. Perhaps they could also take it further and develop their own, more complicated designs and rules along a similar theme.